“The School of Communication at American University has entered a new and exclusive partnership with the The Washington Post for a named Fellowship. This unique opportunity offers the Fellow full tuition, plus a $30,000 yearly stipend and the chance to work side-by-side with top journalists at The Washington Post, one of the world’s leading news organizations. This is the only such fellowship with The Washington Post in the Washington, D.C., metropolitan area. Applications will be considered through May 30, 2011, or until the best candidate is selected. Coursework begins August 1, 2011. This opportunity is only available to those with several years of professional experience and who become enrolled in the SOC weekday graduate journalism program. During the academic year, Washington Post/SOC Fellows will work 15-20 hours a week at The Washington Post while pursuing an advanced degree in an 11-month program. Fellows work full time at the Post over the summer. Fellows can also take advantage of SOC’s innovative centers for new forms of journalism such as, J-Lab, the Investigative Reporting Workshop, and the Center for Social Media, as well as the university’s deep intellectual and educational resources. Experience and interest in topic areas such as religion, transportation, education, law enforcement or government is a plus. The Fellow will be a part of the Post‘s local staff of 60 reporters, the region’s dominant news-gathering organization, in print and online. Post reporters cover government, politics, crime, social issues, transportation, development and education; they write feature and trend stories; they investigate major local institutions, and they blog, shoot video, chat online and work intensively with databases. Intercultural Dialogue through Fairytales, Drama and Art is a multi-partner project with 35 schools participating from all over Europe. The participants collaborated in order to become familiar with the different cultures of each partner school’s home country through the use of fairy tales, drama and the arts…Schools involved in this project first created a PowerPoint presentation on their school which was posted on the TwinSpace. They served as a background so that students learned about each other before commencing work on the project itself. Then, each school had to translate one national fairytale into English and then post this translated work on the TwinSpace for all partner schools to view. Students from all schools read all of these translated stories in their English classes. Students of each institution then drew illustrations of their chosen national fairy tale in art class. Next, students from each participating school started performing one partners’ fairy tale in English. These performance are being recorded on DVD and sent to all partners to watch in English classes, and photos are being posted on the TwinSpace. Students can then watch each school’s performance recorded on DVD by each partners school. All fairy tales from all European countries will be published in a book with students illustrations and share between partners and distribute to local community. Teachers and students were also able to communicate and further comment on all aspects of this project via the eTwinning Project Forum and on a Google Group. For further information, see the etwinning site. On 20 May  in Vilnius, Lithuanian Deputy Minister of Foreign Affairs Egidijus Meilunas and representative from Poland’s Borderland Foundation (Fundacja Pogranicze) Malgorzata Czyzewska discussed the events that are being organized on the occasion of the one hundredth birth anniversary of poet Czeslaw Milosz and activities of the Centre for Intercultural Dialogue that will soon be opened, reported BC the press service of the Foreign Affairs Ministry. Czyzewska acquainted the Deputy Minister with plans of the Borderland Foundation on 30 June, on the eve of taking over the Presidency of the European Union by Poland and on the occasion of the one hundredth anniversary of the birth of poet Czeslaw Milosz, to open the Centre for Intercultural Dialogue in the town of Krasnogruda on the Lithuanian-Polish border. The Centre will be dedicated to the strengthening of cross-cultural dialogue in the borderlands of various countries in the world and to the research of such dialogues. According to Czyzewska, the experience that was accumulated over twenty years of the Foundation’s activities will allow to build bridges between the closest neighbours: Belarusians, Poles, Lithuanians and Russians from the Kaliningrad region. The Centre will contribute with education, research, publishing and cultural activities. In her opinion, exchanges of people in culture, historians, teachers and youth from neighbouring countries and cooperation will take place at the Centre. Deputy Minister Meilunas welcomed the Foundation’s initiative and emphasized the benefits. “These activities are very necessary. It is important to have and strengthen the dialogue between Lithuanian and Polish people in culture. It is particularly symbolic that the Centre will operate in the borderlands of a few countries, in a manor that was the property of the family of Milosz, the ‘last national of the Grand Duchy of Lithuania’ in the interwar period,” Deputy Minister Meilunas said. For further information, see the original article published in The Baltic Course, 27 May 2011. The “Arab Spring” as well as recent events in other parts of the world have demonstrated that new communication technologies, such as mobile phones and the internet, are simultaneously new tools for social movement organizing and new tools for surveillance by authoritarian regimes. Though communication theory necessarily transcends particular technologies, software, and websites, digital media have clearly become an important part of the toolkit available to political actors. These technologies are also becoming part of the research toolkit for scholars interested in studying the changing patterns in interpersonal, political, and global communication. How have changing patterns of interpersonal, political, and global communication created new opportunities for social movements, or new means of social control by political elites? The role of social media in new patterns of communication is especially dramatic across North Africa and the Middle East, where decades of authoritarian rule have been challenged—with varying degrees of success. Social media—broadly understood as a range of communication technologies that allow individuals to manage the flow of content across their own networks of family, friends and other social contacts—seem to have had a crucial role in the political upheaval and social protest in several countries. Mass communication has not ceased to be important, but is now joined with a variety of other media with very different properties that may reinforce, displace, counteract, or create fresh new phenomena. This Special Issue seeks original qualitative, comparative, and quantitative research on social media and political change, particularly as related to events in North Africa and the Middle East, but we are also receptive to work on political change in other parts of the developing world. We would welcome manuscripts from a diverse range of methodologies, and covering diverse communities and cultures. Methodological innovations or mixed method approaches are particularly encouraged, and manuscripts on the interpersonal and intergroup aspects of social movement organizing are central interest. Whatever the approach, our goal is to select manuscripts that are grounded in the actual use of social media in promoting or resisting political change in developing countries and regions. If you have questions regarding the appropriateness of a potential submission, please contact Prof. Philip N. Howard (pnhoward@uw.edu). Deadline for Submission is August 15th, 2011, through http://mc.manuscriptcentral.com/jcom. Manuscripts must confirm to all JOC guidelines, including the use of APA 6th edition format and a limit of 30 pages total manuscript length. Please indicate your desire to be considered for the special issue in your cover letter. 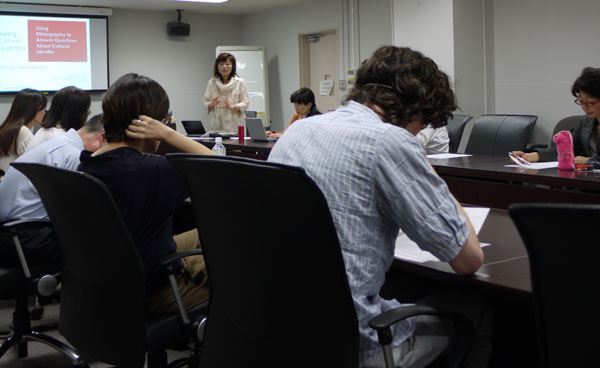 On May 21, 2011 I gave a talk entitled “Asking Cultural Questions: Using Ethnography to Answer Questions about Cultural Identity” to the Department of International Communication, of the School of International Politics, Economics and Communication, at Aoyama Gakuin University in Tokyo, Japan. 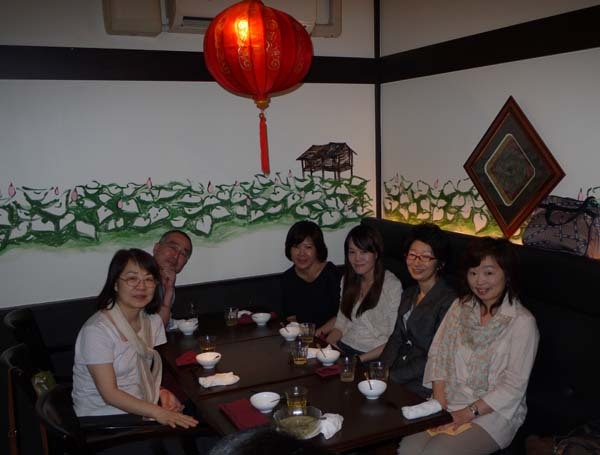 My thanks to Prof. Hisako KaKai and Prof. Kiyoko Sueda, who were the hosts and organizers of the event. After the talk we were treated to an excellent Vietnamese dinner, well attended by many of the graduate students from the presentation as well as the faculty listed above. To all the graduate students I promised to send citations: I really did mean it, so do send me an email as followup! The Center on Philanthropy at Indiana University is very pleased to announce a request for proposal on Advancing Knowledge in Human Services Philanthropy and Nonprofit Organizations (Advancing Knowledge), supported with funding from the Kresge Foundation. An open invitation is now issued for proposals on research in the field of human services philanthropy and nonprofit organizations. Pre-tenure scholars are invited to apply for $25,000 grants to fund research and for the opportunity to join a community of scholars seeking to improve the practice of human services philanthropy. The deadline for proposals is June 27, 2011. Human services organizations play a critical role in providing essential services to low-income and vulnerable populations. Although human services nonprofits provide much-needed resources to households and communities throughout the U.S., more research is needed to understand how human services organizations can improve their practices. Proposals for research projects must focus on human services nonprofit organizations assisting low-income populations in the United States and, must have the potential to affect the nonprofit practice and philanthropic support of human services nonprofits. Advancing Knowledge responds to the need to build a research community of human services scholars whose work has the potential to improve the practice of human services organizations and philanthropy. Through this initiative, Advancing Knowledge will create a cohort of pre-tenure scholars working in collaboration with tenured mentors and an Advisory Council. Pre-tenure scholars at accredited universities and nonprofit research institutions in the United States who received terminal degrees within the past seven years will be eligible for research funding. Ten proposals for funding of up to $25,000 per project will be awarded over two years (two disbursements of $12,500). Recipient scholars will work with mentors and an Advisory Council to produce and disseminate findings that improve the practice of human services philanthropy. Research using existing data sources is encouraged. Recipients will be invited to workshops held at the Association for Research on Nonprofit Organizations and Voluntary Action annual conferences in 2011 and 2012. Scholars, mentors, and the Advisory Council will also collaborate to generate a “State of the Research” report on human services philanthropy. “We are inviting academic editorial contributors to the Multimedia Encyclopedia of Women in Today’s World, a new online library reference that will look at women today around the world and delve into the contexts of being female in the 21st century. Thus the scope of the encyclopedia will focus on women’s status starting in approximately 2000 and look forward. women in different cultures/countries; arts and media; business and economics; criminal justice; education; family studies; health; media; military; politics; science and technology; sports; environmental studies; and religion. This comprehensive project is being published in stages by SAGE Reference and will be marketed to academic and public libraries as a digital product available to students via the library’s electronic services. The General Editors, who will be reviewing each submission to the project, are Dr.
Mary Zeiss Stange of Skidmore College, and Dr. Carol K. Oyster of the University of Wisconsin-La Crosse. SAGE Publications offers an honorarium ranging from SAGE book credits for smaller articles up to a free set of the printed product or access to the online product for contributions totaling 10,000 words or more. If you would like to contribute to building a truly outstanding reference with the Multimedia Encyclopedia of Women in Today’s World, please contact me by the e-mail information below. Please provide a brief summary of your academic/publishing credentials in women’s and gender issues and the articles you are interested in writing and I will confirm availability.